If you were awake during American history class, you might remember the story of the pioneers who travelled by covered wagon to western America. Being a difficult and dangerous journey, the pioneers would gather at places like St. Louis to form long wagon trains. They felt that there would be greater safety in numbers and they were right. As they traveled west, they encountered many natural obstacles and they were able to help each other. Often they would circle their wagons to experience community, to share food and water, and to dance and sing around the fire to drive away the loneliness and fear. But the thing they feared most was an attack by Native Americans.When attacked, the wagons would circle up to form a defensive barrier and the pioneers would shoot from behind their wagons. Usually, this tactic was successful and the wagon train could move on to the promise of distant lands. You see it is our Orthodox nature to circle up. This is why we have Synods and Diocesan Councils and Ecumenical Councils.The First Ecumenical Council faced a fierce enemy in Arius and many pioneers lost their way. Other enemies would come and again the Church would circle its wagons. Each time, thank God, the Church was victorious. Sadly, when we personally face opposition, the last thing we do is to circle up with other Orthodox Christians. Usually we run off in a snit to hide and lick our wounds. Maybe it’s just the modern culture in us, a culture that has isolated us in our houses and automobiles and work places. It is a culture that has murdered hospitality as a way of life. We are Daniel Boone crying out for elbow room and the hope to live untroubled in a cabin by ourselves.The problem is, when the enemy attacks, we are all alone. It’s interesting to me that given the state of things today, the recession, the broken economy and empty stock portfolios, I don’t hear the Orthodox even talk about the possibility of circling up, of working together and sharing resources. The spirit of self-sufficiency continues to rule, and not the spirit of community. In modern times, circling up has also become a serious problem.Some Orthodox people have circled up to leave out other Orthodox pioneers. They call them enemies and heretics and then start shooting at them. It is as if they believe that they are a big circle, an Ecumenical Council, who can decide who is in and who is out. It is very sad indeed. The thing is that like all wagon trains, we have a Wagon Master. He is very skilled because he knows the way of our enemies and knows the way to the Far Lands. He will tell us when it s time to have another big circle (an ecumenical council). No matter what the other little wagon circles say, an ecumenical council they are not. Even so, let’s not give up circling the wagons but let it be for protection and not for exclusion. Let us seek out and welcome other pioneers into our circle. We face fierce enemies today who are very skilled in warfare. We cannot do it alone and we will have no protection if we travel alone in our little spiritual wagon. The going ahead may be very difficult. If it is, and even if isn’t, let’s circle the wagons, pilgrims! He was a Titan who lead a rebellion against the Olympians. In his failure, he was made to hold up the sky on his shoulders. (He is often shown holding up the world, but this is incorrect) This would be his eternal punishment. Once, he almost tricked Hercules into holding up the sky for him, but Hercules saw through his scheme and was able to escape. Poor, heroic Atlas! Carrying burdens seems to be an inescapable fact of life. 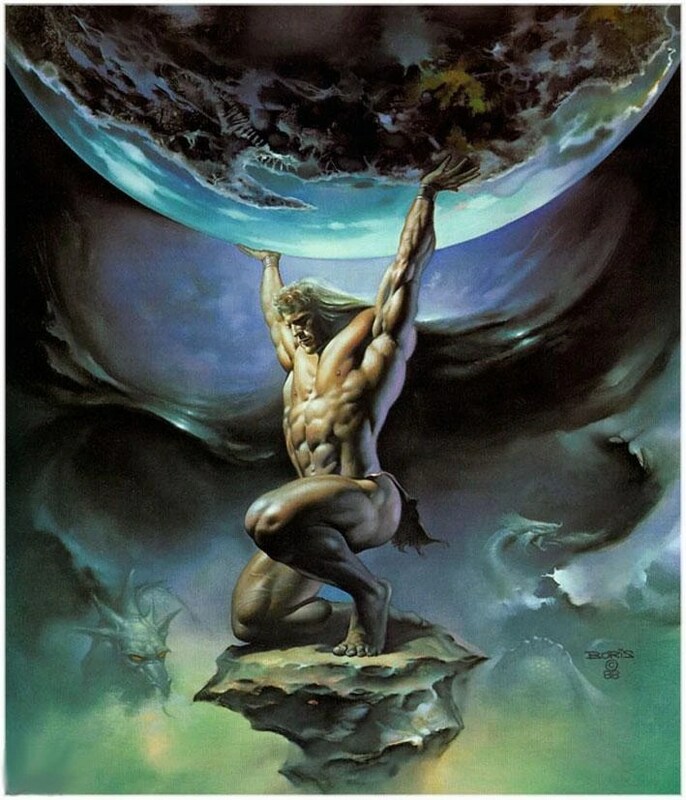 Sometimes, the burdens are so heavy it feels like Atlas holding up the sky. I’ve carried heavy loads of wood or stone until my shoulders and arms and legs ached with the effort. I managed this weight because I knew I would soon set it down. The terror of the story of Atlas is the hopelessness of it, knowing that you can never set your burden down. The terror of my life is the feeling that there are some burdens I will never lay down. Some one once referred to the 20th Century as the “Age of Anxiety.” When you read the history of that time, there was certainly much to be anxious about. I wonder if that tag continues to be applied to the 21st Century? Certainly, these are fearful times. The economy has crashed and our financial security has largely vanished. Now, we hear of impending pandemics and nuclear terrorism, and the level of anxiety is reaching new heights. I was reading The Missionary Letters of St. Nikolai Velimirovich. In letter 59, he wrote to an American, John Davis, who had a deep fear about the population explosion of the human race. He wrote, “Of course, one who forgets God, takes God’s worries upon himself. And God’s worries are not something that weak human backs can carry.” What an interesting thought– fear makes us forget God, and by forgetfulness, we carry God’s worries. When this happens, we become the New Atlas– we take the sky upon our shoulders. Yet, we are not Titans and our backs cannot carry the load. The Lord says to all who would be like Atlas, “Come unto me all who labor and are heavy laden and I will give you rest. Cast your cares upon me…Take my yoke upon you, for my yoke is easy and my burden is light.” Christ is the only true Atlas, and in his Cross, He took upon himself the full weight of the world. Weak sinner that I am, I’ve found that its easier to pull the yoke with Christ than to be an heroic Titan carrying the sky on my shoulders. The heavy stone has been rolled away. Christ is Risen! Hey, Atlas! Lay that burden down! You are currently browsing the Ramblings of a Redneck Priest blog archives for May, 2009.